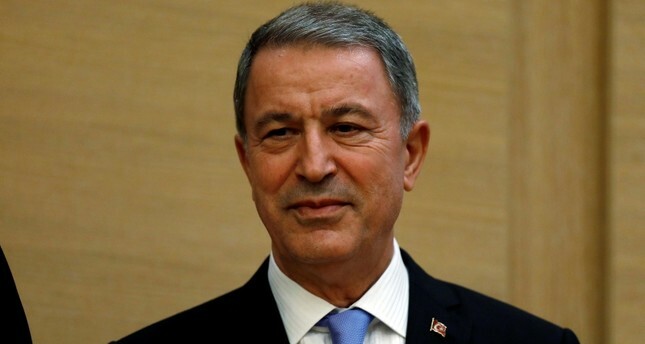 Air and ground attacks on Syria's Idlib must stop and a cease-fire and stability must be established in the area immediately, Defense Minister Hulusi Akar said on Monday. Speaking at the 99th anniversary of Afghanistan's Independence Day, Akar said civilians would suffer greatly as a result of attacks by Assad regime and Russian forces. Akar said Turkey stood against the use of weapons, including chemical ones, against civilians. Reiterating Turkey's stance against terrorist groups, Akar said Turkey would continue its war against terror. According to a Syrian Civil Defense group White Helmets official, at least 29 civilians have been killed and dozens injured in Idlib since Assad regime and allied forces resumed air and ground bombardments in the area, while an U.N. official said more than 30,000 people have fled their homes. The presidents of Turkey, Russia and Iran met on Friday in Tehran, as part of the trilateral efforts on finding a solution to the Syrian civil war. While the summit underlined that "there could be no military solution to the Syrian conflict" and called for advancing the political process to reach a negotiated solution, no cease-fire agreement was reached. During the summit, Erdoğan called for a truce in an attempt to avoid a full-scale Syrian regime assault on Idlib. But Putin said this would be pointless as it would not involve extremist militant groups that Russia deems terrorists, and Rouhani said the Syrian regime must regain control over all its territory. Turkey and other international actors have repeatedly warned the Assad regime and its backers, Russia and Iran, to avoid any offensive on Idlib due to the possibility of a humanitarian catastrophe that would cause massive casualties and a new migration wave. In an effort to restore calm in the region and improve the humanitarian situation, the three guarantor states Turkey, Iran and Russia launched the Astana process on Jan. 23, 2017, to complement the U.N.-brokered talks in Geneva. Idlib is one of the de-escalation areas designated in the Astana talks between Turkey and the regime's allies Russia and Iran and has been turned into a shelter for opposition fighters and their families who were evacuated from different parts of the war-torn country. More than half a million people have been killed and 11 million forced to flee their homes in the seven-year-old war.